TS Vidya Volunteers 2018 Online Application form, District wise 16781 Vacancies list @ cdse.telangana.gov.in : Telangana Vidya Volunteers Application Form/ TS Vidya Volunteers Notification 2018-19 in Telangana. Vidya Volunteers Salary Details,TS Vidya Volunteers Posts Recruitment Notification 2018 Online Application ssa.tg.nic.in in Telangana. TS Vidya Volunteers Posts Recruitment Notification 2018 Online Application, Engaging of Vidya Volunteers and Remuneration Monthly Rs 12000. Eligibility of Vidya Volunteers Appointment vacancies Posts. Vidhya Volunteers in existing vacancies posts as on 30th May, 2018. Academic Instructors Appointment Instructions. Selection Guidelines, Primary, UP and High Schools District wise Vidya Volunteers vacancies, TS District VVs and School wise Sanction Posts LP - Telugu, Hindi, Urdu, SA - English , Maths , PS , Bio. Science, Social, SGT Posts. Who are Eligible and Interested Candidates should apply online for the Recruitment of Vidya Volunteers in Telangana at the Official website of SSA ssa.tg.nic.in.Telangana Sarva Sikshya Abhiyan SSA intimate to Vidya Volunteers Vacancies in Telangana Primary School , UP School and High Schools . Appointment Vidya Volunteers in academic calendar 2018-19 Only. 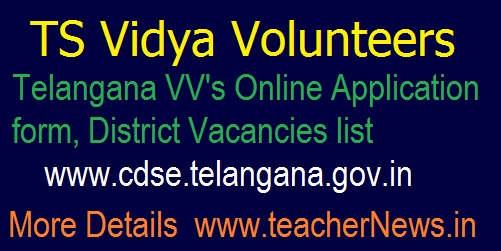 Telangana Vidya Volunteers District wise vacancies, Online Apply DEO Adilabad, Bhadradri Kothagudem, Hyderabad, Jagtial, Jangaon, Jayashankar Bhupalpally, Jogulamba Gadwal, Kamareddy, Karimnagar, Khammam, Kumuram Bheem, Mahabubabad, Mahbubnagar, Mancherial, Medak, Medchal, Nagarkurnool, Nalgonda, Nirmal, Nizamabad, Peddapalli, Rajanna Sircilla, Rangareddy, Sangareddy, Siddipet, Suryapet, Vikarabad, Wanaparthy, Warangal (Rural), Warangal (Urban) and Yadadri Bhuvanagiri Districts. and Other Oriental Title/ Bhasha Praveena/ Vidhwan along with Marks Memo. SGT Posts : Intermediate with D.Ed. In case of non availability of candidates with D.Ed, B.Ed candidates may be considered. School Asst. : Gegree with B.Ed. How to download the TS Teachers online application? Fill application form with correct details then send. TS/ Telangana Vidya Volunteers Online Application form @ cdse.telangana.gov.in. TS Vidya Volunteers Recruitment 2018 Notification released by TS SSA. How to Apply TS VVs Post, Telangana VVs District and Subject wise Vacancies list Download. PLEASE EXTEND THE DATE.... Because of saturday and sunday are holiday So plz extend.. Kindly Requested..